Can a Random Group of People On the Internet Interview a Candidate Better Than the Pros? 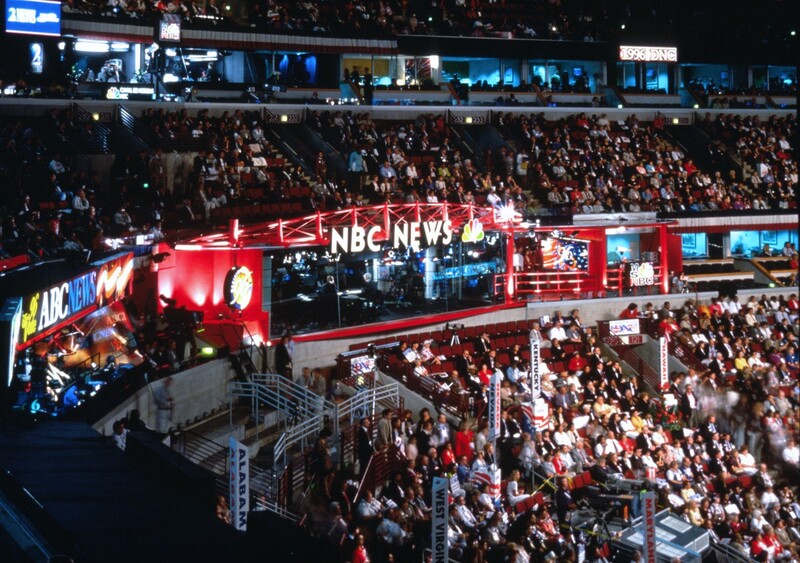 Democratic National Convention 1996. Photo courtesy International Contractors, Inc.
With a sample size of one, David Weinberger’s clever survey, ‘Who does a better interview — a pro at CNN or the crowd from Reddit?’ is just the provocation I need to explain something about that weird contraption: campaign journalism, American-style, presidential election division. It is justified under one principle and actualized under another. Different way to say it: the declared purpose and the available product don’t match up. Knowing this allows us to interpret Weinberger’s intervention in a slightly different way. 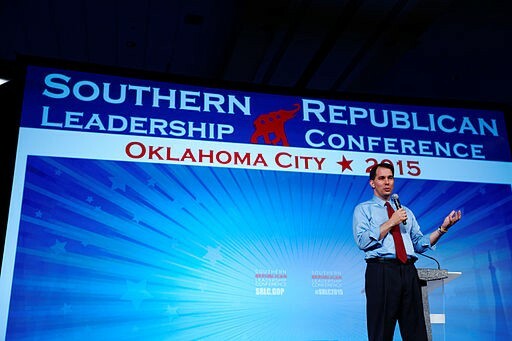 Governor Scott Walker of Wisconsin speaking early in the campaign season in Oklahoma City, May, 2015. Photo by Michael Vadon. The official purpose and public rationale for campaign coverage, American-style is simple and basic. The voters have to make an important decision and they need good information. To make a good choice at the ballot— to follow the race, understand the action, participate in a campaign for the popular vote — they need the intervention of skilled journalists. And to provide that help the campaign press circulates a product we all recognize: election news the way the American media does it. Voters have to make a decision and they need good information. That’s our product. The good information voters need. That’s the argument. But it’s not the product. Not really. Look at how the campaign coverage contraption begins pumping out episodes in the story well before most voters are ready to follow it. Why does the product get made before a majority of users are even in the market for it? Simplest answer: it’s not really for them. Sometimes it is. But mostly not. Let me explain. Covering the campaign, the way the American media does it, is not a wholly rational enterprise. Big established news organizations commit to it because it is a sign of being serious at news and public service. Up-and-comers with enlarged ambitions commit to it because it’s a sign of being serious, period. Internet companies that aren’t in news commit to it because it’s a sign of being… different than what people were thinking about you. Univision commits to campaign journalism to win respect for Univision and to fight for its audience’s big issue: immigration. You represent as national in magazine space by sending some of your people to cover the campaign. If you’re ‘declared ideology’ media you cover the campaign. If you don’t try to express it in different coverage your fans are going to wonder about you. Could The Guardian complete its launch as national news player in the U.S. without covering the 2012 campaign? Impossible. It would mean they aren’t really trying to be a presence. People wind up committing campaign coverage because it bestows presence: one way to show up on the national stage as big in news. The top brands show up biggest. I did not understand this until I went to my first convention in Boston in 2004. I got my credentials and headed to the sports arena where the event would start the next day. Gaze up at the sky boxes and you see the reigning powers: CBS, NBC, ABC, CNN, FOX, PBS… This is one way they try to dominate the national imagination in news. It is worth a lot to their companies. But that’s a different product! Probability talk for an insider group, not “Voters have to make a decision…” These are high-information users: a niche market. They already know what’s going on. They want to know what’s going to affect the election. The decision they need help with is not for whom to vote or “do you represent my interests?” It’s which of these teams is likely to make the finals? For that they need good intelligence. Campaign journalism, American-style, often tries to be good intelligence for insiders and (it’s a term of art…) political junkies. This has little to do with helping voters reach a decision. Political reporters believe they need to vet the candidates and ask them tough questions that would not come up in a chat with ordinary voters. They express solidarity with one another by struggling with the campaigns over the daily narrative. Will it be the message the candidate and staff want the day to be about? Or the questions the journalists want the candidate to answer? The voters are not a party to that struggle, except that both sides claim to be acting in their interests. This too shapes a lot of coverage. Not just, “Voters have to make a decision and they need good information.” But: People don’t want to be bothered unless it’s important. Also: (from the press)We are not anyone’s handmaiden! We put our own imprint on the race, but not as your messaging system. It’s our job to vet these candidates. One of them could be president! The product reflects group motivations like these. It’s not an entirely rational enterprise. When CNN’s Brianna Keilar interviews Sen. Bernie Sanders on “State of the Union,” she’s not doing: inform the voters so they can make a smart call. She’s doing probability talk for insiders. And “it’s our job to vet these guys,” a struggle with the candidates. She’s doing symbolic work for CNN: we’re center, Bernie, you’re fringe. But when Reddit asks questions the amusing thing is they actually are voters who have to make a decision and they need good information from the candidates. CNN explains its coverage that way. The product is often elsewhere. This response is part of a continuing conversation that you can join — simply write in the response field below. I teach journalism at NYU, and direct the Membership Puzzle Project. Advisor to De Correspondent as they expand to English-language publishing.